Carnivorous plants fascinate with how they lure, catch, kill and digest insects. During the summer of 2012, Savage Gardens told the story of the captivating, the bizarre, the larger-than-life, real and imaginary world of carnivorous plants and their astounding adaptations to inhospitable habitats. Combining science, botany and hands-on activity, Savage Gardens demonstrated the wonders of these unique plants and the importance of preserving the delicate environments in which they live. Carnivorous plants may seem exotic, but many of them, such as the Venus flytrap, are native to North America. Unfortunately, more than 95 percent of the original carnivorous plant habitats along the U.S. southeast coastal plain have been destroyed. The exhibit featured the infamous Venus flytrap (Dionaea muscipula), allowing visitors to control the bizarre muscle-like movement of its traps in action. Other carnivorous plants fascinated as well with their creative, cunning and tenacious trapping strategies. The innocent-looking flower of the Butterwort (Pinguicula) is surrounded by leaves that glisten with the strongest "glue" found in nature. The Sundew (Drosera), embraces insects with shimmering, dew-like tentacles. The American Pitcher Plant (Sarracenia) offers a narcotic nectar causing intoxicated patrons to take a clumsy tumble into a pool of digestive enzymes. The similar approach of some larger varieties of the Tropical Pitcher Plant (Nepenthes) has been known to capture small mammals. 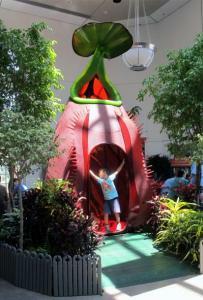 The 10-feet-tall Tropical Pitcher Plant (Nepenthes) invited visitors to step inside to imagine the fate of an unlucky insect. 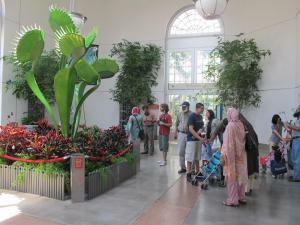 Seven North American Pitcher Plant (Sarracenia) sculptures reached heights of 15 feet and welcomed visitors to the Conservatory. The 9-feet-tall Venus flytrap (Dionaea muscipula) sculpture replicated the closing of the "trap" through the use of hydraulics. The Sundew (Drosera) came to life as fiber optics illuminated more than 500 hundred of the sculpture's tentacles. 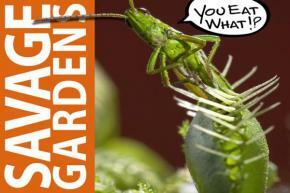 NBC4: Insect-Eating Plants on Display in D.C.